If you know anything about me, you probably know that I have a sweet tooth (my header gives that little fact about me away). I have long held a place in my heart for rice krispie treats, but only recently have I discovered flavored rice krispie treats. Rice krispie treats are simple, but flavored rice krispie treats are simply amazing. 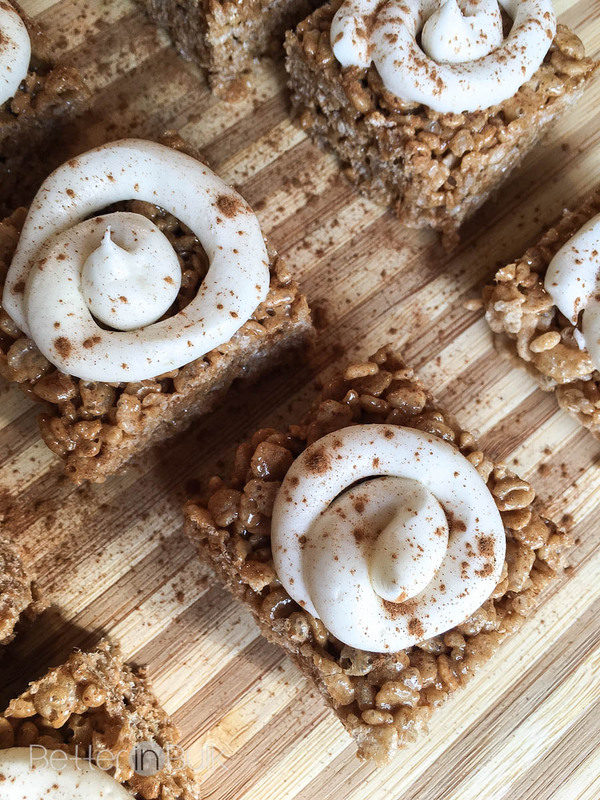 A few months ago, I made cinnamon roll rice krispie treats and had to hold myself back from eating the entire pan. They were that good. I’ve made them a couple times since then, but for some odd reason never got around to sharing the recipe here. I apologize. It took a week of filling in for the 5 Minutes for Mom Food column to make me realize my over-sight and go searching for the pictures I took when I made them back in January. 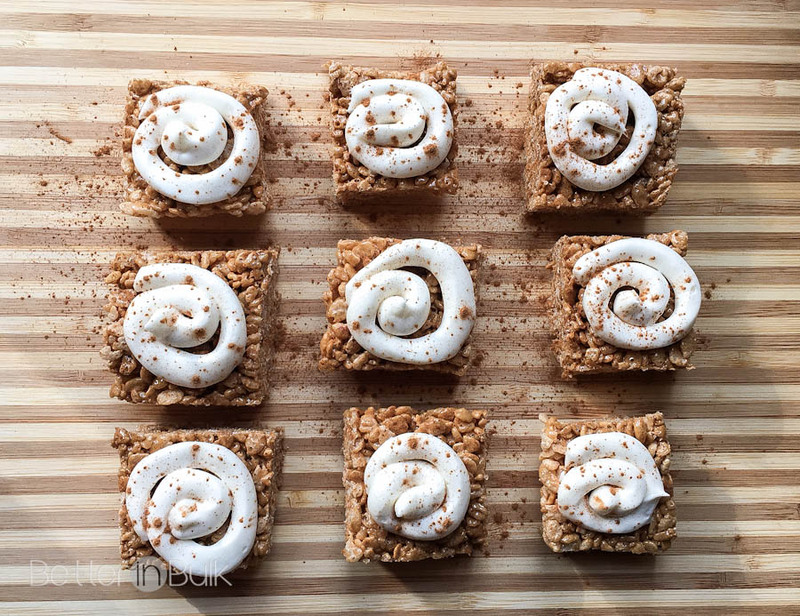 Combine the ease of rice krispie treats with the flavor of cinnamon rolls. Butter a 9x13 dish; set aside. Stir in salt, molasses, and cinnamon. Add marshmallows to melted butter mixture and stir constantly until marshmallows have melted. Fold in Rice Krispie Cereal, a cup at a time, and stir until evenly coated. Pour Rice Krispie Treat mixture into buttered baking dish. Spread mixture evenly into pan with a buttered spatula, waxed paper, or buttered hands. Allow to cool several minutes, then cut while still slightly warm. Optional: Use your hands to round the edges of the cut squares. Allow to cool completely (remember not to stack rice krispie treats while they are cooling or they will be forever stuck together). 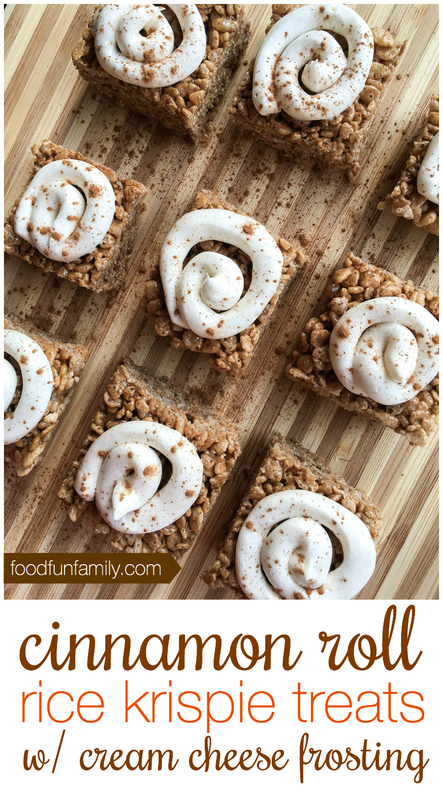 Swirl cream cheese frosting on the tops of the rice krispie treats and then dust lightly with cinnamon. Whip together butter and cream cheese with an electric mixer until fluffy. Stir in vanilla and then add in powdered sugar, 1 cup at a time, and mix until smooth and fluffy. 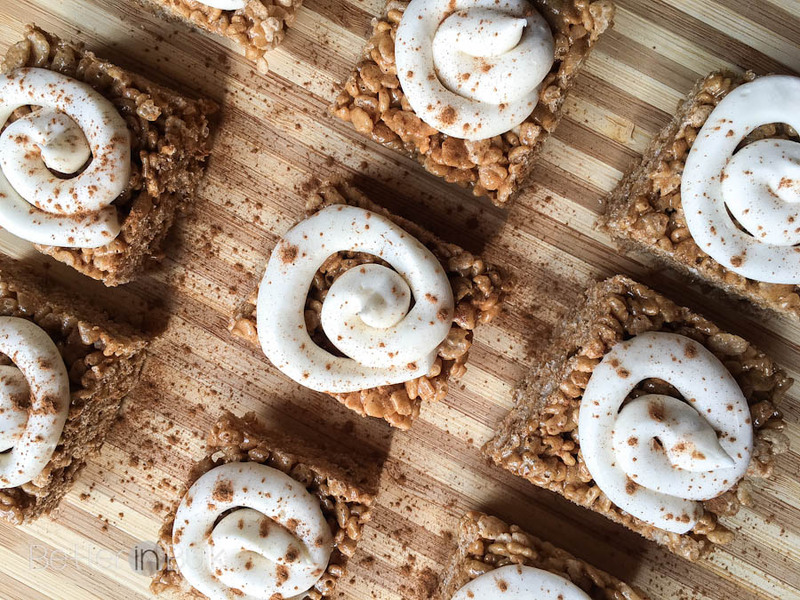 Spread or pipe over rice krispie treats. Recipe based on the recipe I found on Cooking Classy. Thank you, Jaclyn, for such amazing recipes! Looking for more recipes? Follow my personal recipe board on Pinterest! Follow Lolli | Food Fun Family’s board Food Fun Family on Pinterest. I love everything about these treats! Thanks for linking up with What’s Cookin’ Wednesday! Yum! and way easier to make then classic cinnamon rolls. Pinned! Those look so yummy and I just love cinnamon too! Oh my goodness…these look SO good! Thanks! I took this to the Homeschool meeting tonight and everyone loved it! Wow, this looks like a fun recipe! I know my kids would love it!! Yum, this looks absolutely delicious. Thanks so much for sharing. I can’t believe you’ve been holding out on us with not sharing this recipe – it looks delicious! I’ve pinned it to my my “must try” list! Yum!